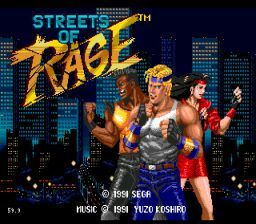 Play Streets of Rage Now! As the chaos continued at full strength, three young police officers tried to establish a special attack unit. They were repeatedly refused by their superiors, most of whom had either been bought by the organization or were too afraid to make a stand. One day, when they could no longer stand by and watch their city being demolished, they quit the force! Adam Hunter, Axel Stone and Blaze Fielding decided to forego their careers in legal law enforcement and put their lives on the line. They are without weapons, but each possesses great hand-to-hand combat abilities. Take them into the heart of the city and battle the most dangerous wave of bad dudes and chicks ever assembled. Make the city a place where people no longer have to walk the Streets of Rage! Keep moving down the street. Attack and kill the people, or they will try to kill you. Pick up and use weapons to defeat your enemies, otherwise you must fight. Break objects found in the street to find weapons or food. Walk as far right as you can in the stage, until you reach the end. There, you must defeat the boss to move on to the next level.